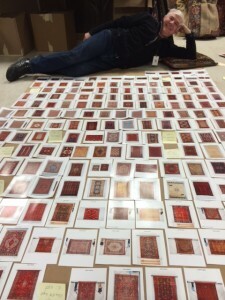 Meet the Experts | Lawrence Kearney | Oriental Rugs & Carpets Appraiser | Part II | Skinner Inc. In the early 1980s I’d go out to villages in western Turkey and buy new, vegetable-dyed, hand-spun, wool-made rugs. A few of the weavers just “had it.” In dance and music, for example, you can tell when a particular choreographer or musician is putting everything into a piece. It’s the same way with rugs and textiles. I noticed that while two rugs may have had the same design, one woman was giving her work everything she had, while her neighbor was just going through the motions. When it comes to antique rugs, I’m most interested in examples where you can tell the maker wasn’t just cranking something out. Who were the makers of these antique rugs? Well, the vast majority of oriental rugs are commercial products, and have been produced and sold commercially since the time of the Silk Road. These rugs were not woven by somebody’s grandma on the back of a camel crossing the desert. Most Persian rugs, for example, were made in workshops. Village rugs, on the other hand, are more of a cottage industry. The weavers, who are almost all women, are making rugs when they have spare time, especially in the winter. In most of the cultures where rugs are made, women do not have equal status. However, a woman’s skill as a weaver or rug-maker can bring honor to herself and her family. I imagine for some women – and this involves some degree of romanticism on my part – that weaving is an area of her life where she is allowed some range of expression. Could you tell us about your time as a features editor of the Oriental Rug Review? I wrote auction reviews, and tried to give the most honest assessment of the artistic merit of things that passed through particular auctions. I also enjoyed writing a column of advice for the “rug-lorn.” One of the curious things about rugs is the vast majority of people who are passionate about them are men. This doesn’t seem to be true for other kinds of textiles, such as quilts or hooked rugs or lace. But there is something about rugs that seems to really draw men in. I have no idea what that is, but keeping this fact in mind, I would make up amusing questions and answers. For example, I’d imagine some poor guy who is an orthodontist in his regular life, has paid too much for a rug, and is trying to hide it from his wife. The column must have been popular! You’re a poet as well. Do you see a connection between poetry and weaving? In my experience, poetry works by associating one image with another image. When I’m writing a poem, I might look at a bookcase and associate that with rock strata by the ocean. I get a similar feeling from really good village rugs. The weaver might throw in a couple of chickens, not because the chickens make sense, but because that’s what she was thinking about. Weaving is a much slower art form than poetry, though. It might take a whole day to add some chickens. But the weaver is speaking directly about her experience of the world, and that’s what I try to do in poetry. What are your plans for the Skinner Fine Oriental Rugs & Carpets department? I aim to offer the most authentic, beautiful, and artistic rugs and textiles that I can find. 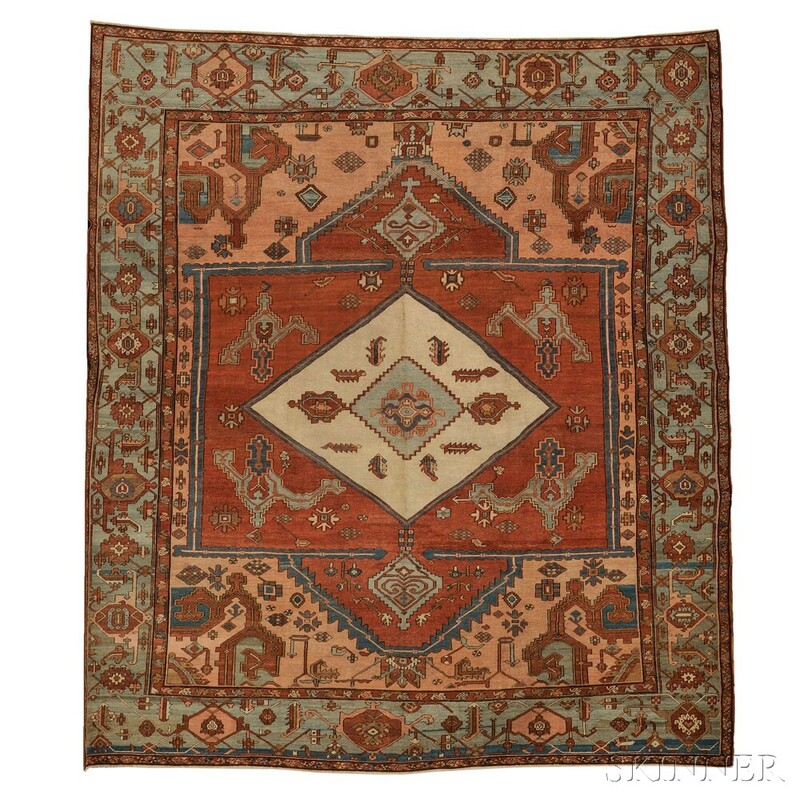 The next Fine Oriental Rugs & Carpets auction will take place in Boston on March 22, 2014 at 12PM. This entry was posted in Blog and tagged fine carpets, fine rugs, fine textiles, Lawrence Kearney, Meet the Experts, oriental carpets, oriental rug review, oriental rugs, persian rugs, poetry, rug appraiser, rug auction, Silk Road, textile auction, textiles, Turkey, village rugs, weaving by Skinner. Bookmark the permalink. Pingback: Meet the Experts | Lawrence Kearney | Oriental Rugs & Carpets Appraiser | Part I | Skinner Inc.
Pingback: Oriental Rugs & Carpets Auction | The Collection of Grover Schiltz | Skinner | Skinner Inc.
Lawrence. Email me when u have a chance or call me at 860-416-8289. Tom Landers/ palisades trading co.